HWiNFO32 are professional hardware information and diagnostic tools supporting latest components, industry technologies and standards. Both tools are designed to collect and present the maximum amount of information possible about computer's hardware which makes them suitable for users searching for driver updates, computer manufacturers, system integrators and technical experts as well. 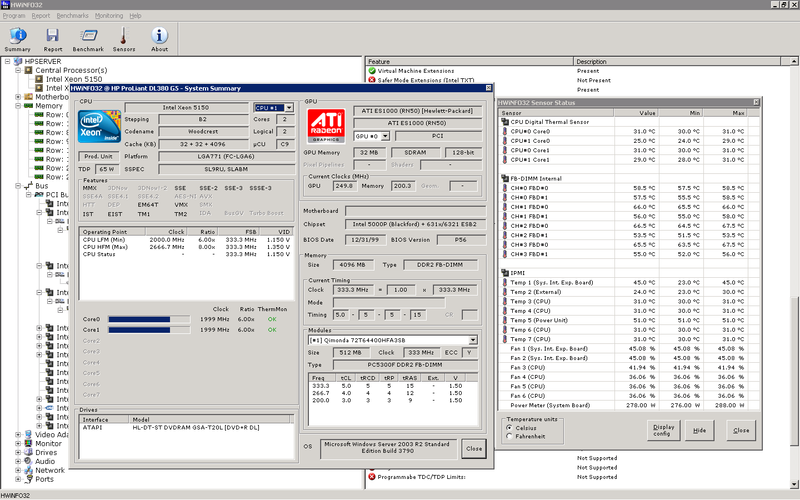 HWiNFO32 is a free tool that will provide professional hardware information and diagnostics for you computer. It is supporting the latest components, technologies, standards and novelties. Just run it and you will get all the information about your components including drivers versions, components manufacturers and system integrators. The collected information are presented on simple screen reports in various formats like TXT, CSV, XML, HTML, MHTML easy to understand by everybody. * Enhanced support of ATI R8xx (Evergreen) family (clock, properties). * Added support of Fintek F71808E sensor. Qweas is providing links to HWiNFO32 3.94.1550 as a courtesy, and makes no representations regarding HWiNFO32 or any other applications or any information related thereto. Any questions, complaints or claims regarding this application HWiNFO32 3.94.1550 must be directed to the appropriate software vendor. You may click the publisher link of HWiNFO32 on the top of this page to get more details about the vendor.